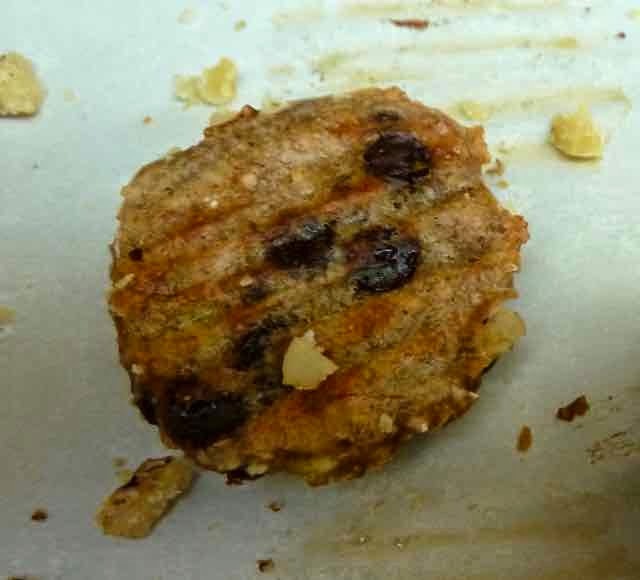 My friend found a recipe in a magazine for 3-ingredient GF Banana Oatmeal Cookies and made them. She is not as into baking as I am and she loved that they were no fuss and easy to make. After tasting them I decided to make them myself, adding a few more ingredients. The cookies are yummy with a soft, moist and slightly chewy texture. They passed the child and adult tasters approval. Even those of us who love to bake (and make fancy and time consuming desserts) appreciate an easy and fast recipe. There are always days you don’t have a lot of time or energy for something more complicated. I also love that there are no sweeteners in the recipe. If you choose to add chocolate chips they do have some sugar, but using only raisins, fruit is all that gives these cookies their sweetness. No eggs or dairy makes them allergy friendly and vegan too. You can play around by adding coconut, chopped nuts, dates or other dried fruits. I made some with vanilla extract and some with almond extract. I suppose you could try some orange or lemon extract or zest also. Be sure to use certified gluten free oats. I have to say something here about oats vs gluten free oats vs certified gluten free oats. Oats themselves are naturally gluten free. So why can’t we just use regular oats instead of the certified gluten free ones that cost at least twice as much? Regular oats are grown where oats and other gluten containing grains grow so gluten containing grains will get mixed in when the oats are harvested. On regular farms, oats are harvested and processed on the same equipment as wheat and other grains, so there will be some gluten in there. With certified gluten free oats, the oats are grown on farms dedicated to growing gf oats, and are harvested and processed on equipment dedicated to gf oats. When something is labeled certified GF it means that the product is tested at various steps of the processing to assure that the products are free of gluten. Certified GF products have tested to have zero ppm of gluten in them. When something is labeled GF (not certified GF) it can still have gluten in it, and testing has shown that most products labeled GF (but not certified GF) can have way more than the <20 ppm allowed by law. Some have tested to have gluten in the hundreds of ppm. There are no regulations requiring companies to test products for gluten even if they are labeled GF. Don’t be fooled. Look for “Certified GF” labels on products not just GF. A bit more info about products labeled gluten free when they contain oats that are not specified as gf oats. Some of the major manufacturers of cereals are coming out with some GF cereals that contain oats. 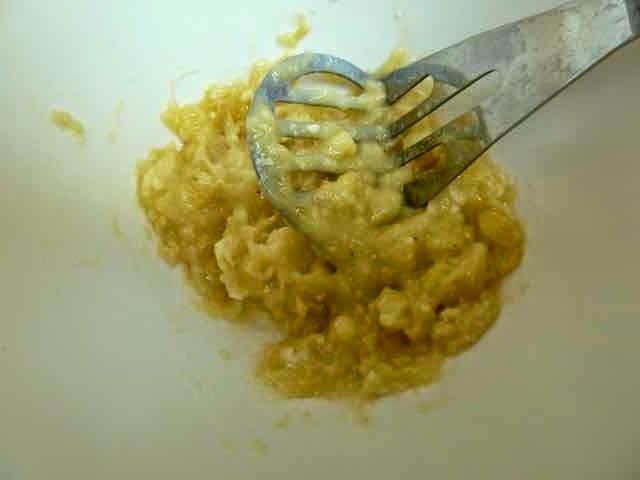 The oats are being grown and processed as regular oats are, but they are then screened by some process to take out the gluten containing substances that are mixed in with the oats. I am a bit wary about eating these products until it is made known if the oats and/or the final products are tested for gluten after the gluten is taken out and how many ppm remain afterwards. 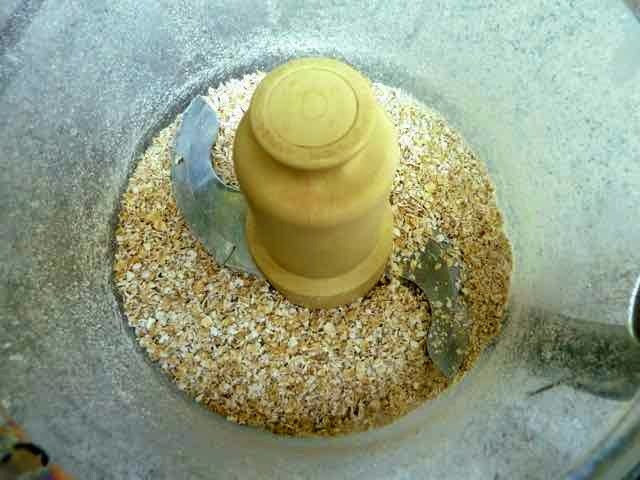 If you use Old Fashioned Oats then pulse several times in a food processor until there is some fine flour and smaller sized oats. Old Fashioned Oats after grinding in the food processor. Mash the bananas with a fork or potato masher. Mashing the bananas with a potato masher. Add the rest of the ingredients of your choice and mix well. 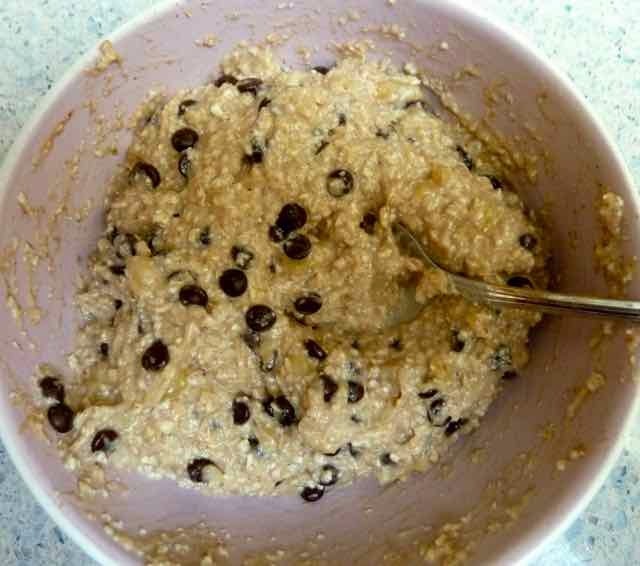 Adding some chocolate chips to the batter. 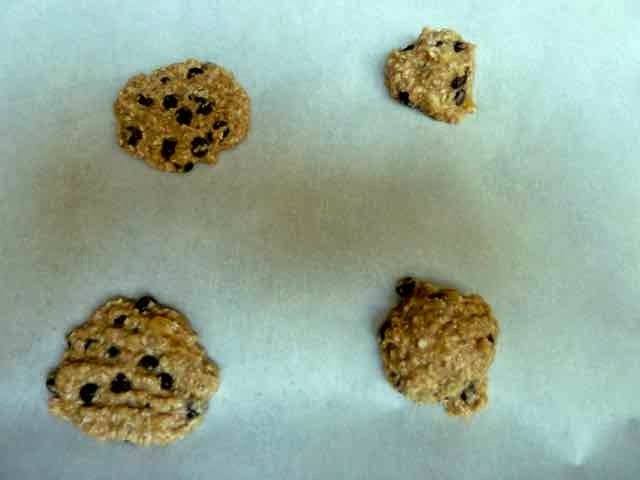 Using a scoop that measures 1-inch across or a teaspoon, scoop out cookies onto the prepared baking sheet. The cookies do not spread while baking so they can be placed close together. I tried these flattened with a fork and as a ball. Some people preferred the flattened cookies and some the balls. Batter scooped onto parchment paper. Some cookies were flattened with a fork. Bake for 15 minutes or until the bottoms are lightly browned. With my oven I put one baking sheet into another to insulate the bottoms of the cookies to keep them from burning and baked them about 20 minutes. chocolate chips, nuts and almond extract in various combinations to portions of the batter. My favorite was chocolate chips and raisins and nuts and vanilla & almond extracts. 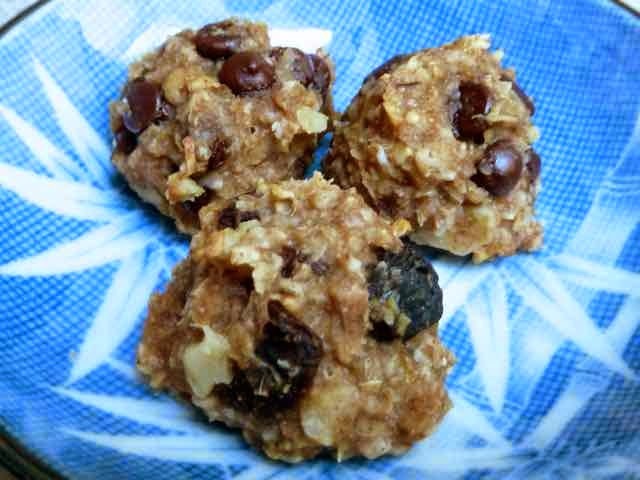 GLUTEN FREE NO GUILT OATMEAL BANANA COOKIES Makes about 30 1-inch cookies 1 cup - about 2 Bananas - mashed 1 cup Certified GF Oats - Quick Cooking If you use Old Fashioned Oats then pulse several times in a food processor until there is some fine flour and smaller sized oats. 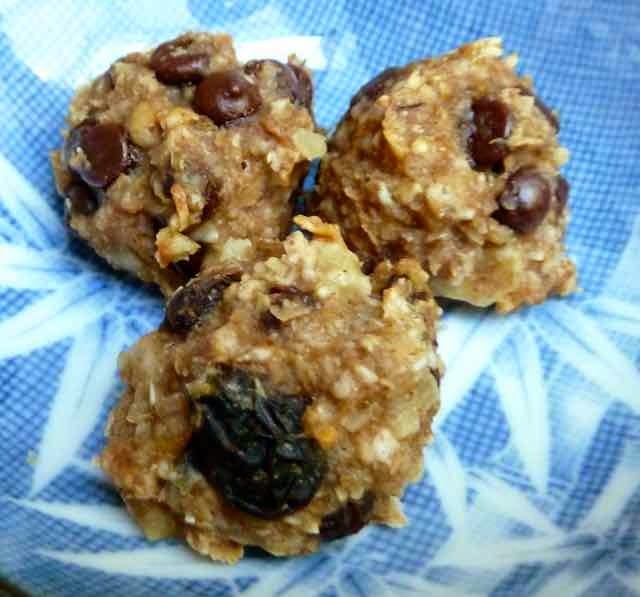 1/3 - 1/2 cup Raisins (plumped by soaking them in hot water for 10 minutes) &/or Chocolate Chips &/or Chopped Nuts &/or Unsweetened Shredded Coconut 1/8 tsp. Sea Salt (optional) 1 tsp. Vanilla Extract or Almond Extract or 1/2 tsp. of each (optional) 1/2 tsp. Cinnamon (optional) Directions Preheat the oven to 350℉. parchment or silpat Mash the bananas with a fork or potato masher. Add the rest of the ingredients of your choice and mix well. 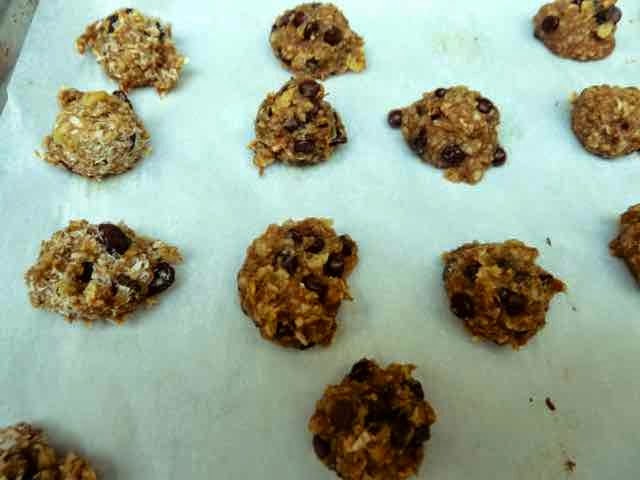 Using a scoop that measures 1-inch across or a teaspoon, scoop out cookies onto the prepared baking sheet. The cookies do not spread while baking so they can be placed close together. I tried these flattened with a fork and as a ball. Some people preferred the flattened cookies and some the balls. Bake for 15 minutes or until the bottoms are lightly browned. With my oven I put one baking sheet into another to insulate the bottoms of the cookies to keep them from burning and baked them about 20 minutes.